Mrs May’s speech comes amid reports MPs plan to take control of Brexit if her deal is defeated. About 100 Conservative MPs, and the Democratic Unionist Party’s 10 MPs, are currently expected to join Labour and the other opposition parties in voting against the deal. She is to add that she now believes MPs blocking Brexit is more likely than a no-deal scenario. Quick guide: What is a no-deal Brexit? A “no-deal” Brexit is where the UK would cut all ties with the European Union overnight. Theresa May’s government, and many others, believe this would be hugely damaging and want a more gradual withdrawal. But if Parliament can’t agree on that, and nothing else takes its place, the UK will leave without a deal. This would mean the UK would not have to obey EU rules. Instead, it would need to follow World Trade Organization terms on trade. Many businesses would see new taxes on imports, exports and services, which are likely to increase their operating costs. That means the prices of some goods in UK shops could go up. The UK would also lose the trade agreements it had with other countries as a member of the EU, all of which would need to be renegotiated alongside the new agreement with the EU itself. Manufacturers in the UK expect to face delays in components coming across the border. The UK would be free to set its own immigration controls. However some UK professionals working in the EU and UK expats could face uncertainty until their status was clarified. The European Commission has said that even in a no-deal scenario, UK travellers won’t need a visa for short visits of up to 90 days. The border between Northern Ireland and the Irish republic would become an external frontier for the EU with customs and immigration controls, though how and where any checks would be made is not clear. Some Leave supporters think that leaving without a deal would be positive if the right preparations were made. They say criticism is scaremongering and any short term pain would be for long term gain. But critics – including both Brexit supporters and opponents – say that leaving without a deal would be a disaster for the UK: driving up food prices, leading to shortages of goods and gridlock on some roads in the South East resulting from extra border checks. Mrs May will say: “I ask MPs to consider the consequences of their actions on the faith of the British people in our democracy. “Imagine if an anti-devolution House of Commons had said to the people of Scotland or Wales that despite voting in favour of a devolved legislature, Parliament knew better and would overrule them. Or else force them to vote again. “What if we found ourselves in a situation where Parliament tried to take the UK out of the EU in opposition to a remain vote? She is to give the example of the Welsh devolution referendum in 1997, when people voted by a margin of 0.3% to create the Welsh Assembly, arguing: “That result was accepted by both sides and the popular legitimacy of that institution has never seriously been questioned. The UK will leave the EU on Friday 29 March unless MPs vote to delay or cancel Brexit. Liberal Democrat leader Vince Cable said: “The increasingly desperate language from the prime minister more than suggests a great deal of panic. He argued that best way forward was to have another referendum, including the option to remain in the EU. 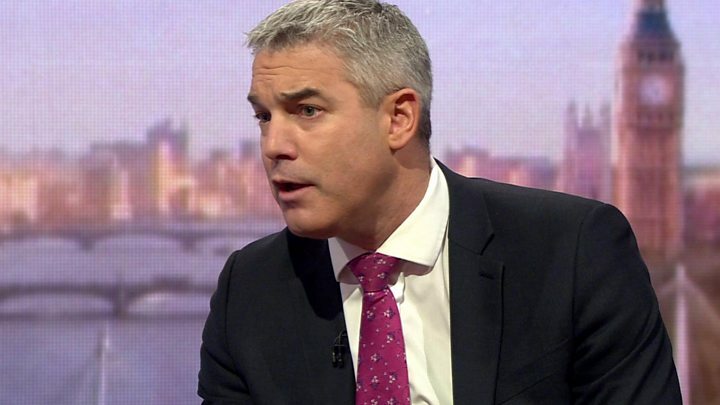 Brexit Secretary Stephen Barclay told the BBC’s Andrew Marr show there was greater “uncertainty” after Commons Speaker John Bercow’s decision last week to allow MPs to change the parliamentary timetable. He warned “those on the Brexiteer side seeking ideological purity” by voting down Mrs May’s deal they risked “leaving the door ajar to ways that increase the risk to Brexit”. 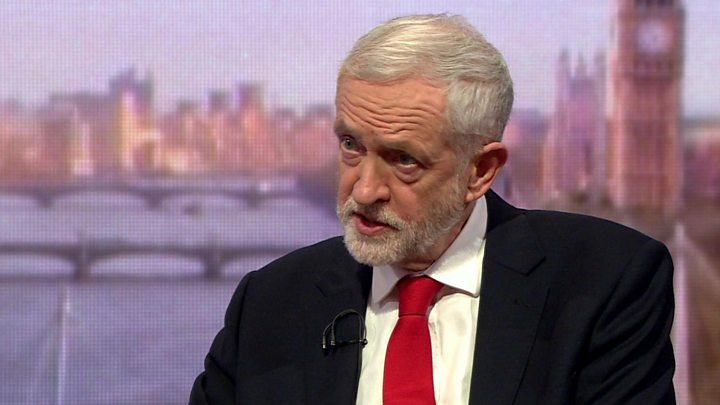 “There are lots of different plans being put forward by Members of Parliament that don’t respect the result (of the referendum) or risk no deal,” he added. Meanwhile Conservative former minister Nick Boles accused the government of a “gross dereliction of responsibility” for not approaching opposition parties sooner to try to reach a compromise on Brexit. The Grantham and Stamford MP told BBC Radio 4’s The Westminster Hour: “I think that the penny is dropping and there are certainly lots of voices in the cabinet who have been pushing the prime minister in recent meetings very hard to start those cross-party conversations. What about reports of MPs planning to take over Brexit? The UK will leave the EU on 29 March unless there is a new act of Parliament preventing that. Because the government controls the timetable for Commons business, it was assumed that this would not be possible. But a group of MPs, including former Tory ministers, are reported by the Sunday Times to be working on a way to allow non-government members to take control of the timetable and bring forward legislation making it illegal to leave the EU without a deal, if Mrs May loses Tuesday’s vote. Downing Street has said it is “extremely concerned” about the reported plot, which it says could potentially overturn centuries of Parliamentary precedent. Are more Tory backbenchers coming round to the deal? Four Conservative Brexiteer MPs who have been critics of the withdrawal agreement have now said they will support the government in the vote on Tuesday. Sir Geoffrey Clifton-Brown, MP for the Cotswolds, said he still had “deep misgivings” about many aspects of Mrs May’s deal. Former Public Accounts Committee chairman Sir Edward Leigh said Brexit-supporting MPs were “playing with fire” if they voted down the deal. Andrew Murrison, a former minister, and Caroline Johnson, MP for Sleaford and North Hykeham, also said they were backing the government despite reservations.